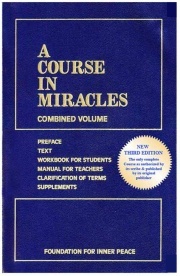 A Course in Miracles is a self-study course consisting of three volumes - a Text, a Workbook For Students, and a Manual For Teachers. The Course was taken down by a research psychologist who heard an inner voice dictating the material to her. The teaching of the Course strikes at the heart of the basic human condition, which it characterizes as one of conflict, suffering and despair, fearful isolation from God, others, and even ourselves. The Course aims at the healing of this condition by affecting a profound change in our basic outlook. Its tool is the healing of human relationships, which it accomplishes by transforming our perception of others to seeing them as fundamentally good and holy. This opens the way for love, which replaces the fear and separateness, and which the Course describes as our natural inheritance. Since its publication in 1976, the Course has gained immense popularity and acclaim. An increasing number of people from varying traditions, cultures, and walks of life have found a home in it. This Combined Volume, Third Edition of A Course in Miracles, is the only edition that contains in one place all of the writings that Dr. Helen Schucman, its Scribe, authorized to be printed. The Combined Volume also includes the Supplements to A Course in Miracles, "Psychotherapy: Purpose, Process and Practice" and "The Song of Prayer." These sections are extensions of the Course principles, which were dictated to Dr. Schucman shortly after she completed A Course in Miracles.